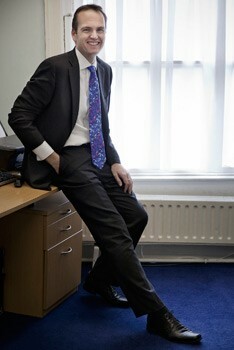 Hi My Name is David Kiely, walking into New You for the first time was difficult. I commenced their Lean Body 7 week program. 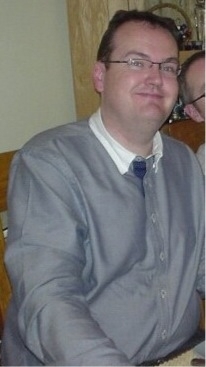 At a 111.7kg or 17and a half stone I was an unfit 37 year old business man. I had a body fat of 38% and a fat mass of 42kg.My visceral fat (midsection fat stored around my organs) the most concerning of all was nearly 3 times above recommended levels. My muscle mass of 65kg and waist measurement of 46inches was affecting my energy levels. My confidence was a little low. My body fat has since dropped another 2% to an athletic 13.5%, down from an original 38% and I now weigh 78kg with a waist of 34 inches. I’m in much better shape than I was in college. My body feels really tight , my shape has dramatically changed and my suits hang the way they should. *It’s so much easier to buy clothes now, and it’s a better way to live. I’m more focused and I have more energy to do the things I really enjoy. As I awoke one Saturday morning I rolled over in bed. It was as if I came to my senses. My body was moving one way and the excess fat I was carrying from head to toe was moving the other way. It didn’t feel great to say the least. I was fairly thin during my college days, so I really had got to the point of no return, this gradual deterioration of my body had finally given me the lever to do something about it. I got on the Internet and found New You. I was a little skeptical because the testimonials on the web site were so dramatic. I wasn’t just looking for a quick fix, where I might lose lots of weight and put it all back on again. I believed they might be using some type of Atkins diet or it was product related. Anyway at this point I was really driven. I sent an email on Sunday evening inquiring. 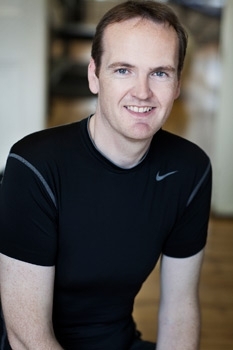 They got back to me the next morning and I arranged to have a chat with John Kavanagh the head trainer at New You. John explained that my lifestyle and ability to deal with stress had probably impacted negatively upon my body composition. He said accelerated muscle atrophy may have occurred during my college years. I had gone from being a chubby teenager to a skinny university student. 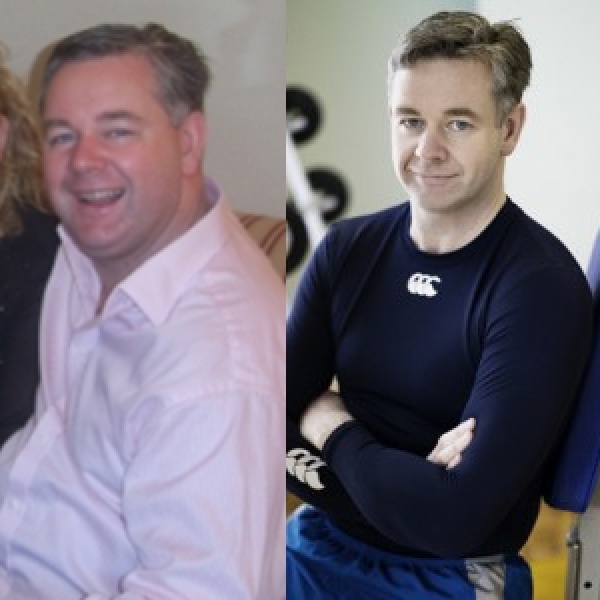 I started my business degree in Waterford just under 15 stone. 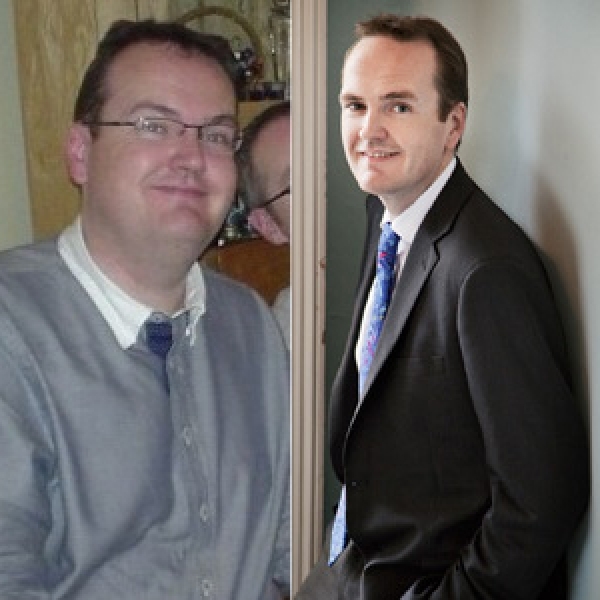 Three years later I started my masters at 11 and a half stone and a year later I was just under 11 stone. I wasn’t very sporty in school or college. So the reduction in muscle mass had probably slowed down my metabolism, when I started the typical office style eating my metabolism couldn’t deal with the infrequent meals ,poor quality foods and the fat kept climbing until I started with New You. I had my first assessment at New You . I weighed 111.7 kg and my waist was 46 inches. My body fat was 38%. This was carried out by the in house nurse Ruth. She completed a very detailed analysis of my life style, eating habits, diet and exercise history. She used a Bioelectrical Impedance Analysis machine to measure my body composition. * I was uncomfortable to see that I had a metabolic age of 52. I also completed a multi-choice questionnaire which was meant to determine my state of change. I got top marks of 5 so it seemed that I was in a good place mentally to get going. The Nurse did concern me a little when she explained the implications of my waist measurement, visceral fat and body fat levels combined with my elevated blood pressure. I came in to look and feel better but seeing things in black and white really gave me a different perspective. I was also fairly dehydrated with a Total Body Water of 47%. The ideal is around 55%. 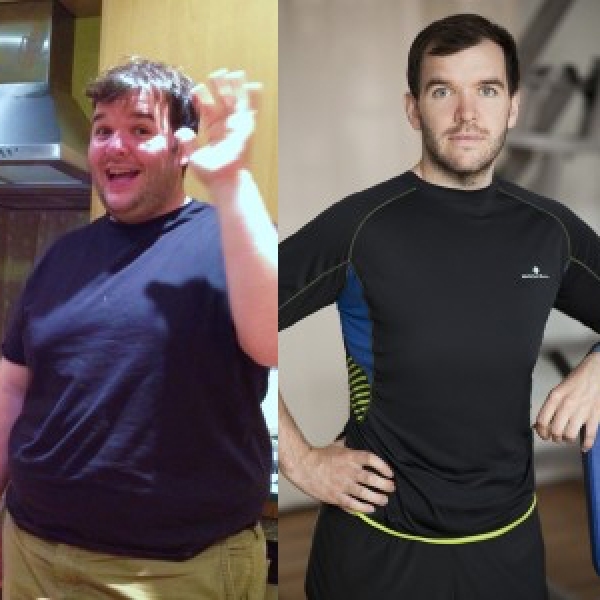 Two days later I attended New You for a nutrition consultation. My food was planned out to a tee and based around what foods I could actually eat. I’m a fairly picky eater. It was based around my body composition, more specifically my Fat Free Mass which was 64kgs. Thankfully it was a balanced diet of protein, complex carbohydrates, and fats spread out over 4 to 5 meals per day. 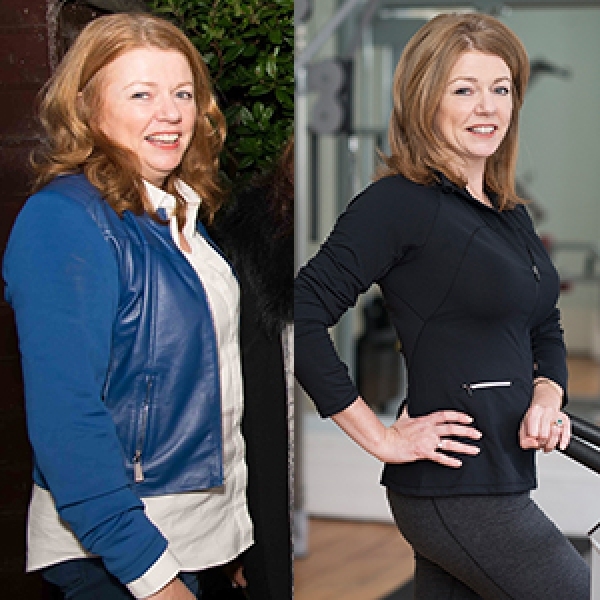 * I was eating plenty of carbohydrates including whole grain brown bread from Superquinn and potatoes. It was just a matter of getting organised to ensure that I was eating regularly to stimulate my metabolism. Having energy to train, to live and also to supply my body with enough nutrients to allow for optimum recovery. I learned that keeping my insulin levels balanced throughout the day had a major impact on my sleep quality, which was a critical tool in burning body fat and replacing lean tissue. I had my second assessment I was down to 16stone 4 lbs or 104.4kgs , my waist had dropped to 44 ½ inches and my body fat was at 32%. However I was finding some of the foods difficult to continue with so Keith replaced part of my breakfast from eggs to a milk shake which I made up myself with berries. It tasted fine and was easy to digest. I continued on training 3 days per week with Keith eating properly balanced meals, sleeping great whilst still enjoying my weekends. On the 25th of April I had my next screening and I was down another 6 lbs to 15stone 12 lbs and my waist dropped another inch to 43 inches whilst my body fat was down to 30%. 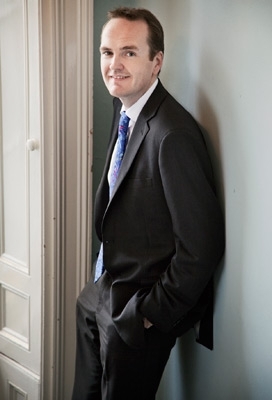 At this stage I couldn’t believe how much more energy vitality and confidence I had. Life in general was getting better all the time. 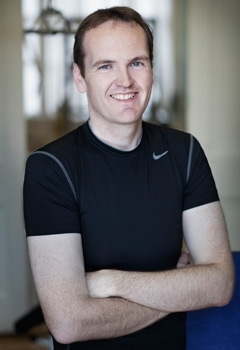 * On the 10th of May at my next assessment my body fat was down to 26.9% and my weight was now 98kg about 15 stone 7 lbs and my visceral fat had gone from 15 to 10 .A third of the fat that was stored around my organs had GONE .Keith was delighted because this was going to make future fat loss easier because of the benefits to my endocrine system. At the end of my 7 week program my body had dropped to 93 kg or 14stone 9lbs my waist was 40 inches, my body fat 24.6% down from 38% and my visceral was down another unit to 9.I had lost a total of 40 lbs and 6 inches from my waist and my muscle mass was at 67.1 kg .I was now starting to feel somewhat athletic. At this stage I felt great but I knew I had more to achieve. I wanted to get to the point where it would be easier to stay lean rather than get fat again. So I signed for another 7 week program. I wanted to get my body fat under 20%. Keith explained that as we got closer to the ultimate goal changes might be a little more challenging as Homeostasis might be an issue. We needed to be very precise with regard to training intensity and recovery. Furthermore my body fat was 17.8% nearly perfect for my age, my visceral was a perfect 6, my waist was 37 inches and my weight was down to 85 kg or 13stone 5 lbs. A good friend of mine who came back from Australia, who hadn’t seen me in a while said “you’re looking like you did in college. I was pretty thrilled. 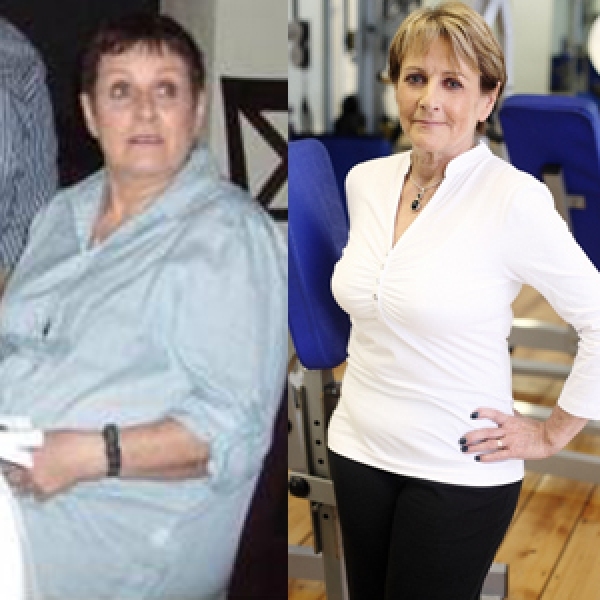 After completing 2 lean body programs at New You I was fairly astonished at what we had achieved. It had definitely changed my shape and changed my life. I was now set to go off on a well deserved holiday. But I was worried I might put a lot of weight back on. Keith assured me it wouldn’t happen because I now had a metabolic age of a 28 year old and my BMR was way over 2000 calories per day. He told me as long as I didn’t go off the deep end, I might continue to burn more fat and gain some muscle while relaxing on holiday. He was right I came back to New You to get checked and I was 79.9kg my waist had dropped to 34 ½ inches and my body fat was 15%. I had my last assessment in New You on the 12th of September. My waist is now 34 inches, that’s athletic, my body fat is 13.7% that’s athletic and my body weight is 78kg. That is over 5 stone of body fat in 5 months with holidays and weekends in between. * My visceral fat is the same level as a healthy child reading 4. I have a metabolic age of a 22year old and I have gained nearly 5 lbs of muscle. It’s incredible I feel that my whole physiology has changed. I am still eating plenty of food and enjoying the weekends whilst still getting leaner lighter fitter and stronger. Now I realize what they mean when they say you can turn your metabolism into a fat burning furnace. Having my body in this type of shape is definitely making a significant difference to all aspects of my life.